Ten years ago today, the Maytag plant in Galesburg, Illinois, closed its doors. What's become of the town in the years since? Ten years ago on this day in September, the last Maytag refrigerator moved down the assembly line in Galesburg, Illinois, a quiet little city of 32,000 on the western edge of the Rust Belt. Workers signed the white appliance with a black Sharpie as it passed, said their goodbyes, and left to start new lives. In that same spot, a century earlier, a few dozen men hammered out steel plowing discs in a little brick workshop for nearby prairie farmers. A sprawling patchwork of buildings swallowed the old workshop in the postwar years and, by the early 1970s, the factory buzzed with the work activity of nearly 5,000 people. Called “Appliance City” by some, it supplied millions of appliances each year to America’s kitchens. Today, a decade after the shuttering, the autographed refrigerator sits in the Galesburg Antiques Mall. The former Appliance City site—the size of over 40 football fields packed together—is now mostly rubble and weeds. The Galesburg shuttering, highlighted in Barack Obama’s iconic 2004 Democratic National Convention keynote address, was part of a historic hollowing of the industrial base of the United States. Manufacturing job loss has been a fact of American life since the 1970s, but in the 2000s manufacturing stepped off a cliff, shedding 5.8 million jobs, or about one of every three—most of them before the Great Recession began at the end of 2007. 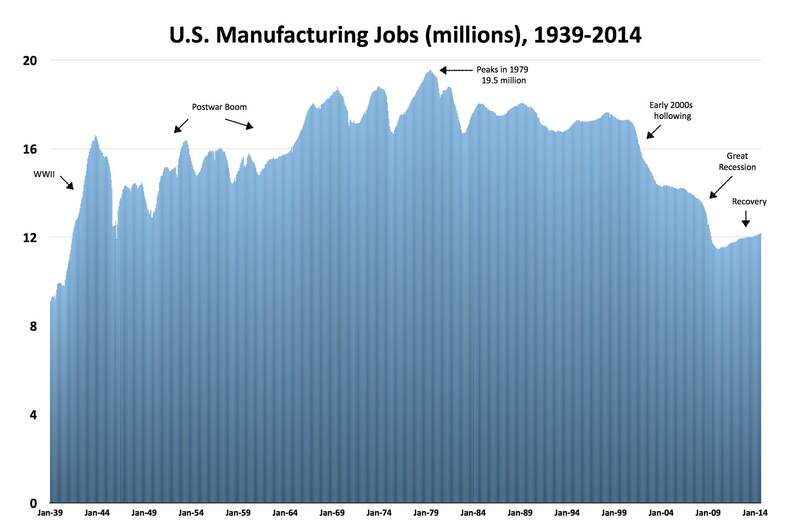 Illinois alone lost 320,900 manufacturing jobs, or 36.6 percent of its total, in the 2000s. Good jobs for those without a college diploma disappeared in the 2000s and generally did not come back. In December of 2000, the ratio of unemployed job seekers to job openings had been 1.1 to 1. At the end of the decade, it spiked to 6.1 to 1. The 2000s was the first recorded decade of zero job growth. Commentators debate offshoring’s role in the jobs crisis, but there’s no doubt that it became downright fashionable in the early Bush years—alongside an increasingly short-term focus of the investor class. Maytag, for example, shifted refrigerator production to Reynosa, Mexico, in 2004. According to manufacturing expert John Shook, “There was a herd mentality to the offshoring” in the early 2000s. In the 1990s, American multinationals added 4.4 million jobs in the U.S. and 2.7 million jobs overseas. But in the 2000s those same multinationals cut 2.9 million American jobs and increased overseas employment by an additional 2.4 million. Chart by author using data from the Bureau of Labor Statistics. Click through for bigger version. Western Illinois had a front-row view of the results of that industrial hollowing: an eroded lower-middle class, a surge in downward mobility, and growing income inequality. In Galesburg, the relative equality of factory life at Maytag—where workers earned, on average, $15.14 an hour and had good benefits—gave way to wildly unequal outcomes. A lucky few got steady jobs with the expanding BNSF Railway (Galesburg is a railroad town) or with John Deere in Moline, Illinois, 50 miles north. They earned more than they had at Maytag, maybe $16 to $22 an hour, though it always came at some cost. One former Maytag worker, Aaron Kemp, calculated that he had logged a few hundred thousand miles in six years at BNSF traveling weekly by car between his family in Illinois and his work on the rails in Texas, New Mexico, Louisiana, and California. Most of the laid-off earned less—often significantly less—than their Maytag wage, even after two or four years of schooling and retraining. One couple, Jackie and Shannon Cummins, together earned almost 60,000 (or about $76,000 in today’s dollars) at Maytag as assemblers; now, a decade later, they scrape by on a combined income of $37,000, even after both retrained and found nearly full-time jobs. Jackie works at a local hospital and Shannon works as a special education aid at a small rural high school, and sorts and folds clothes at Goodwill over some summer breaks. Like many displaced refrigerator-makers, Jackie and Shannon entered the expansive lowest rungs of the healthcare and education sectors, both of which are heavily reliant upon public funding. The lower wages haven’t been the worst of it. For many, especially those with 15 or 20 years at the factory, the loss of good health insurance and a solid pension stings the most. Jackie and Shannon have cycled between private coverage, Medicaid, and no coverage at all in the past few years. As ex-Maytag workers struggle, so does the little city. After Maytag left and more stores in Carl Sandburg Mall shut down, the tax burden shifted to residents, who’ve seen property taxes rise as the housing stock declines. When the Great Recession hit, the state’s fiscal problems pinched education, health, and social-services budgets, just when the need for those resources grew. Since the closing, the percentage of people on Medicaid in Knox County has nearly doubled as employer-based coverage at Maytag and other private employers has waned. Likewise, the percentage of children classified as “low-income” in cash-strapped District 205 in Galesburg increased from 43 percent in 2002 to 68 percent in 2013. This year, the school year began with a tense 15-day strike as the school board and teachers in Galesburg faced off in part over ever-scarcer local resources. Galesburg is in slow decline, but this is hardly the devastated ghost town that some predicted a decade ago. “This town is going to die,” R. J. West, a Maytag worker at the time, told The Register-Mail when the closing announcement was made. Defying the catastrophic forecasts, fewer than one thousand people trickled out of Galesburg in the decade since the shuttering. The railroad, buoyed by its key logistical role in international trade, which includes shipping manufactured products from China to American consumers, has helped, some, to fill the enormous void Maytag left. Though payday loan shops, fast-food joints, and a new Walmart Supercenter line its main commercial strips, there is a hint of gentrification downtown near Knox College, where a new craft brewpub and upscale coffee shop thrive. Consumption patterns in Galesburg, in a modest way, reflect a growing divide among high- and low-end consumers nationwide. Galesburg may never make appliances again, and if it did it would not need the crowded work-city of the early 1970s to make them. There are forward-looking possibilities, however. Newton, Iowa—Maytag’s headquarters for over a century—now manufactures wind towers in a former Maytag laundry plant. Walla Walla, Washington—another town hard hit by free-trade agreements—now manufactures wine (yes, wine-making is manufacturing). To enter the green economy, Newton needed a federal tax credit for wind energy and an innovative state-local plan to get going. In Walla Walla, the local community college developed a specialty in viticulture and enology. U.S. manufacturing faces not only foreign competition and incoherent federal support, but widespread disinterest and even prejudice. For many it’s part of the old economy that is losing out in the inevitable advance toward the post-industrial age. That view is wrong. A 2012 report to the president shows how manufacturing is central to a thriving, modern economy—especially advanced manufacturing in areas like green energy, nanomanufacturing, and three-dimensional printing.